The pattern remains active across the West (minus California) for the next seven days with two to three storm systems lined up. In the Northeast, the jet stream stays favorable for the next seven days with an Alberta Clipper and a larger storm system. Read on for which resorts will see the most snow and the forecast for the best skiing this weekend into next week. Pacific Northwest: There are two to three storm systems lined up over the next seven days. The driest day occurs on Saturday in between storms. Overall, I’m forecasting 1-3 feet of total snow accumulation in the next week on the high Cascades and volcanoes. Whistler Blackcomb: There are two to there storm systems lined up over the next seven days. The snowy winter continues! Overall, I’m forecasting heavy snow accumulation over the next week. Northeast: Cold temps and some lake-effect snow on Thursday followed by a fast moving Alberta Clipper on Friday lingering into Saturday morning. Light to moderate snow accumulation at the ski areas including Killington, Jay Peak, Mount Snow and Sunday River. A larger storm system is possible between Saturday night and Sunday night. Moderate to heavy snow accumulation. 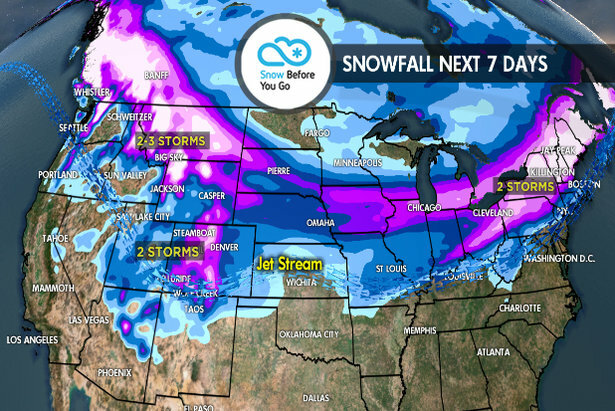 Colorado, Utah: Two storm systems are lined up over the next seven days. 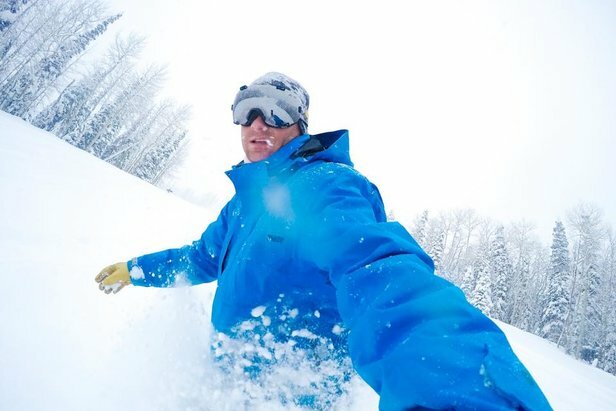 The first storm Friday night into Saturday may not have much of an impact on Utah, and the second storm Monday afternoon into Tuesday looks more promising with heavy snow accumulation. In Colorado, light to moderate snow accumulation occurs Friday night into Saturday. The second storm delivers moderate to heavy snow accumulation between Monday afternoon and Tuesday. Wyoming, Montana, Idaho: There are two to three storm systems lined up over the next seven days. But, temperatures start out abnormally warm on Thursday then turn much colder overnight Thursday into Friday. Some of the precipitation may start as rain at some ski areas then turn over to snow as colder air filters in. Moderate to heavy snow accumulation at higher elevations between Thursday night and Saturday morning. A second storm system arrives between Sunday afternoon and Monday with moderate snow accumulation. A possible fast moving third storm system arrives on Tuesday. Overall, it looks like a good stretch for Jackson Hole, Red Lodge, Bridger Bowl, Big Sky, Sun Valley, Whitefish and Schweitzer. California: The jet stream continues to track too far north until possibly Monday-Tuesday. Even then confidence is low.